A key point here is that every airline has a different system for upgrades. With some airlines, if a seat is available using points in the cabin you want to upgrade to, it’s also available for upgrade. For other airlines, upgrades are only available if they make a certain upgrade class available. For example, American Airlines flights require “C” Space to be available for an upgrade, regardless if there are open seats available using points or cash. You’ll need to learn what you’re looking for, in order to maximize the ExpertFlyer experience. To find upgrades on ExpertFlyer, start by clicking on “Awards And Upgrades”… Next up, enter the flight info you’d expect to enter, like where you’re trying to go and when. We recommend looking for upgrades before purchasing a ticket, so that you can instantly upgrade if opportunities exist, rather than stressing. You can only search for flight upgrades on one airline at a time, so pick your preferred airline and get to it. Remember, each airline has a slightly different system, but for most airlines, you’re looking for seats available using points in the next cabin, or “upgrade space”, which in this case, for American, is known as “C” space. ExpertFlyer shows you all the award or upgrade options you can search for, and since we’re looking for an upgrade, we’ll go for “business – upgrade (C)”. If we wanted to simply search for seats using purely points, we could search one of the other options. Unfortunately, the direct LAX-HKG flight shows no upgrades. Damn. But it does show that on the Dallas to Hong Kong flight, there are 4 upgrades available, which may work instead. If not, you’re not out of luck though! You can actually set alerts which will send you an email if things change on the direct flight, allowing you to jump the upgrade queue and confirm! Now, here’s your opportunity to set that alert. Simply click the exclamation point for the flight you want to set an alert for, and note – you can set as many as you like, for multiple dates. Easy enough, right? That’s all locked in after pressing “verify and create” and if the airline makes a seat available for upgrade, I’ll know right away and can confirm using points or certificates. First things first, you’ll need to select “seat map” as shown above. Once there you’ll enter the info for the flight you’re looking for information on. This works for all cabins, and you’ll be able to set useful alerts and other tools to maximize your experience. For example sake, I’m using this to see if this flight will have the new Singapore Suites. Airlines often change schedules, add flights or change layouts without notice, and ExpertFlyer is a great resource, whichever cabin you’re in. From here you can view open and available seats, any seats blocked out by the airline for VIP’s or any seats occupied. You can also set easy alerts for other seats opening, and find user based feedback on each seat offering. While the previous result offered the old layout, flight 322 has confirmed the new seats. I can set an alert if someone moves from one of the rows I want, or make an alert to let me know if they swap this lovely plane for an older one! The function above is particularly useful for economy, when you’re looking to score two sets together, or just any window seat, and is really great because it allows you to bypass things you’d have to pay for. You can elect not to be shown “paid seats”, so anything that comes up should be able to move into for free. Nice, right? People get panicked online when they see things like “only 2 tickets left” and to be honest, many of those things are lies. Sure, that one booking site may only have access to two more tickets, but it doesn’t always mean that just two cheap tickets are left. You’ll need to brush up on airline fare codes (super nerdy), but if you do, you’ll be rewarded. Here’s how to sort out results for a United flight from New York to Miami… This is a great tool whether you have specific dates or are flexible, and can be really valuable if there’s one flight you really want to snag. Simply navigate to “flight availability” and you’ll find the screen above. For this New York to Miami search on United, we’re presented with all the day’s options, in what looks like a terribly nerdy mess of numbers and letters. But let’s focus on the 7:40AM flight 1109, for the sake of this example. If you hover over any of the letters and numbers, you’ll see how many seats are left in each fare class. For example “F7” means there are 7 “F” class seats for sale, which is full fare first class. On the other end of the spectrum… On the other end of the spectrum, the further to the right and bottom you go for any flight, you’ll find the lowest economy fares. Here they are T,L,K,G,N and so forth. “N” class appears to be the cheapest ticket offered by United, and “N9” means there are at least 9 of them left. It’s important to note that “N” class may require things like 21 day advanced purchase, so even if there are 9 seats, they can disappear. But… if you’re booking way in advance, and know there are plenty of seats left, you can maybe hold off on immediate purchase. Google helps with that info now too. Let’s say you really want to lock in a certain fare class: you can set alerts which will notify you if more than or less than a certain number of seats become available. So if you’re desperate to grab 4 seats for the family, and currently see 9 seats available, you could set an alert, letting you know if less than 5 seats became available, because you’d need to book – fast! 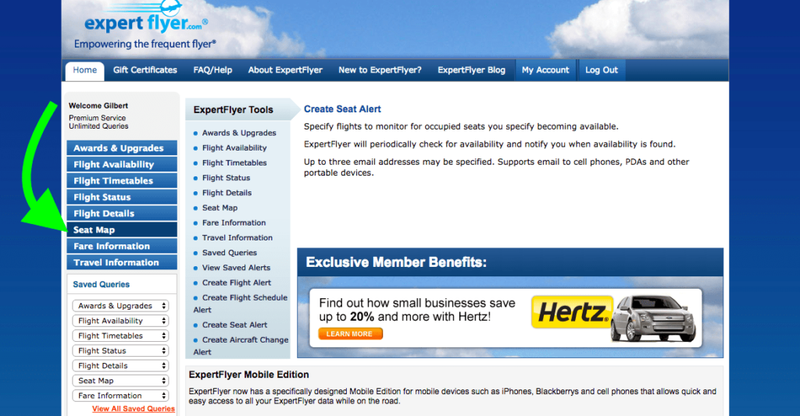 Did this help you not feel like an idiot when using ExpertFlyer for upgrades and other flying perks? great post. perfect timing! I was actually trying to figure out how this expert flyer can be optimized as I need to plan a 3 month travel thing and this post has been extremely useful! On another note, do you guys do miles bookings/travel planning? Its may get a little complex for me! IF it does, I was wondering where to turn. For flight availability coding if a code is showing a fare class quantity of 0 does that mean there will never be new seats offered at that fare class? In another words if it showed 7 (you know there’s at least 7 seats) but if it showed 0 are you out of luck? I’m asking because a flight I’m checking has a lot of 0’s at the lowed class end. @Dan – There’s no sure thing, but if more than one letter (fare bucket) is showing zero, the chances are pretty bad. That means that the cheap fares are gone, and airlines tend to be reluctant to sell seats for cheap if they can get more money for the same seat. On the other hand, sometimes the more expensive seats just aren’t selling, so the airline reallocates seats to the cheap fare bucket to get some money rather than none. It’s just not all that common. Have a backup plan.